100% Egyptian cotton all the time. No blending of lesser quality cotton fibers. • 8.7 yards per pull-skein, six strands, easily divisible, double-mercerized for soft sheen. • Manufactured with reverse twist process to provide virtually knot-free and tangle-free performance. • Consistent dyeing from skein to skein, so that stitchers can depend on the same stitching results within their projects. • 30 beautifully blended shades, all completely colorfast and fade-resistant. Long staple cotton fibers reduce fraying. •Color range for Overdyed Floss is DIFFERENT than for Overdyed Pearl, providing customers with twice as many shades to choose from for their needlework projects. Many people ask the difference between Pearl Cotton and Floss. Floss-this thread is made to be divisible- double-mercerized for soft sheen. We stock 454 colors of solids, 30 colors of overdyed and a large selection of metallic and metallic pearl. Our floss is Sullivan's and is the highest quality manufactured with reverse twist process to provide virtually knot-free and tangle-free performance. Pearl Cotton-100% Egyptian cotton, double mercerized, non-divisible. We stock 30 beautiful shades from Sullivans. 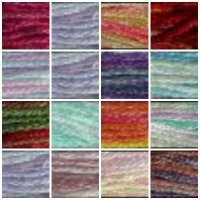 Color range for Overdyed Pearl is DIFFERENT than for Overdyed Floss. This gives customers a broader range of unique shades to use in stitching applications. Sulky Petites™ Cotton Thread is the handiest handwork thread because it is easier, faster and more fun than floss! Since one strand of Sulky 12 wt. Petites Cotton Thread is equivalent to two strands of floss. We stock 39 solid and blendable colors. Aurifloss is perfectly suited for stitching on all types of fabric and is made with 100% long staple cotton. A brilliant six-strand divisible thread that may be used as purchased or one or more strands may be separated to create thread of various thickness. We are just bringing this to the shop-6 colors currently available. size 8 of of both solids and varigated. Valdani Pearl Cotton-exceptionally beautiful Perlé Cotton, Hand-Dyed in Lead-Free Dyes and Guaranteed Colorfast for any Embroidery, Quilting, Appliqué, Crochet, Punchneedle, Rug-Hooking, Thread Embellishment project. We carry the area's largest selection in sizes 12 and 8. This is our FAVORITE thread for softness and color. 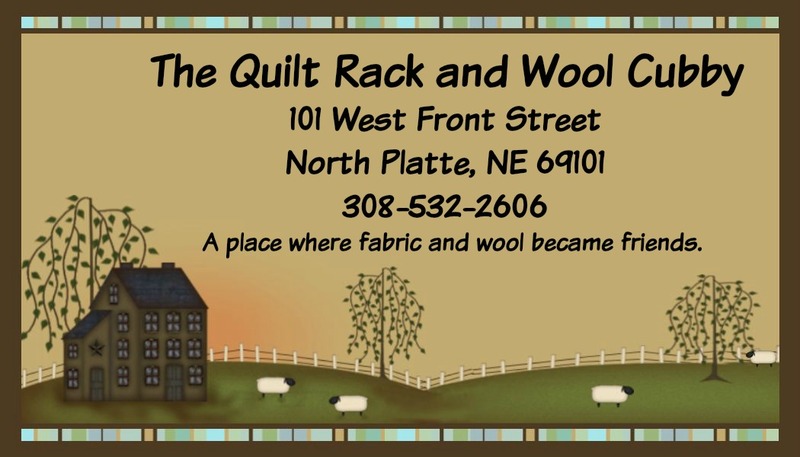 If you hand stitch-The Quilt Rack & Wool Cubby is your source for threads. Fabric collections will be available in late November. We have ordered the ENTIRE collection of these memorable fabrics. 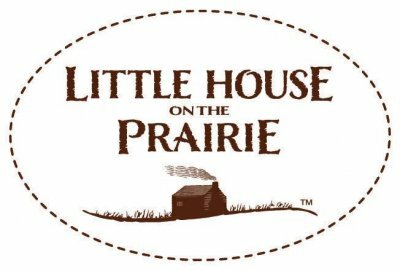 Our shop is offering a great Block-of-the-Week program featuring the fabrics from Little House on the Prairie. This will be a 4-week program offered 2 times each week. The class is FREE with purchase of kit. The quilt we have selected is Ma and Pa's Quilt. 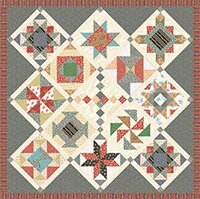 A beautiful sampler quilt that shows off the fabrics from Little House on the Prairie. Learn quick techniques to successfully make your own quilt. We will have one class on Saturdays-then an additional class during the week-pick whichever time works best for you. And remember the class is FREE! We will also offer a couple of additional free classes featuring the fabrics from Little House on the Prairie. We will be announcing an open house day also once the fabrics have arrived for a viewing and early purchases. Come do a Little House on the Prairie with us.